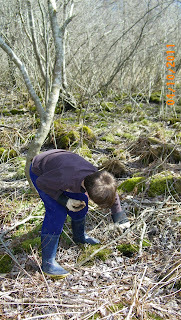 Spring Peeper Farm: Acadian Pickers! Yesterday was such a beautiful day! Such a tease since we're having rain and wind at the moment. AND....we're expecting rain and wind till the weekend coming up. Oh I'm so not impressed! Oh well...eventually we'll have nice weather. After we got back from church yesterday, J. and I decided to go exploring. 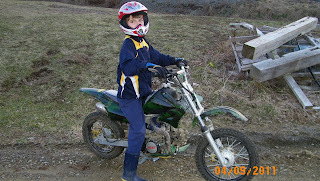 First he practiced on his, what I call, "A mother's nightmare". He's learning well. Dave is training him to drive it sensibly, BUT accidents still happen. Back in the day (don't you just love that saying) they didn't have municipal dumps or garbage trucks passing every week to pick up your garbage. Soooooo....instead they just threw everything in the woods or their own little dump. It might seem like a bad thing now, but then it was the norm. Now it makes for an interesting afternoon. Amateur archeology. J. had a ball. He had my gloves on and started digging. 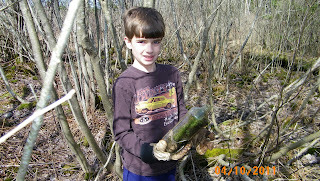 Mostly broken bottles and rusted out buckets, but to him treasures. 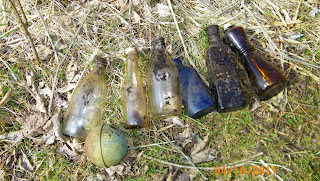 We did find some nice bottles and one weird item. It looked like a buoy. Today I asked Dave, "what do you think this thing is?" He said, "It's a toilet tank floater." Our wonderful finds including the toilet float. And here we thought we had a cool and unusual find! We thought we were just like the American Pickers. I guess not. J. would pull out an old bucket and say ,"I'll give you 50 bucks!" Dave would yell out SOLD! Oh! 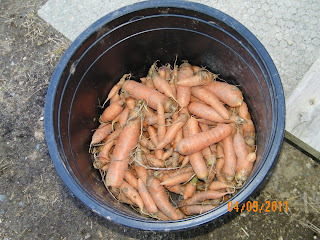 Remember the carrots I left over winter? Well here they are. The tops a mushy, but the goats love them. 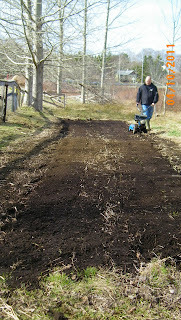 Dave did some recreational tilling yesterday also. Doesn't that nice black earth just scream, PLANT ME! PLANT ME! This weekend was my first hockey free weekend since last October! Free at last, free at last! Thank God Almighty I'm free at last!!! Ok that might be a bit dramatic, but after spending all my weekends either at various hockey rinks or working AND various hockey rinks freezing my buttocks off we deserve a break. Well till next October anyway. Wish I could get soil like that without making 135 trips to Home Depot.